In biblical scholarship, the documentary hypothesis proposes that the Pentateuch (also called the Torah, or first five books of the Hebrew Bible) was not literally revealed by God to Moses, but represents a composite account from several later documents. Four basic sources are identified in the theory, designated as "J" (Yahwist), "E" (Elohist), "P" (Priestly), and "D" (Deuteronomic), usually dated from the ninth or tenth through the fifth centuries B.C.E. Although the hypothesis had many antecedents, it reached its mature expression in the late nineteenth century through the work of Karl Heinrich Graf and Julius Wellhausen and is thus also referred to as the Graf-Wellhausen hypothesis. The documentary hypothesis has been refined and criticized by later writers, but its basic outline remains widely accepted by contemporary biblical scholars. Orthodox Jews and conservative Christians, however, usually reject the theory, affirming that Moses himself is the primary or sole author of the Pentateuch. The hypothesis further postulates the combination of the sources into their current form by an editor known as "R" (for Redactor), who added editorial comments and transitional passages. The specific identity of each author remains unknown, (although a number of candidates have been proposed). However, textual elements identify each source with a specific background and with a specific period in Jewish history. Most scholars associate "J" with the southern Kingdom of Judah around the ninth century B.C.E., and "E" with a northern context slightly later. Both of these sources were informed by various oral traditions known to their authors. The combined "JE" text is thought to have been compiled in the Kingdom of Judah following the destruction of Israel by Assyria in the 720s B.C.E. "P" is often associated with the centralizing religious reforms instituted by king Hezekiah of Judah (reigned c. 716 to 687 B.C.E. ), and "D" with the later reforms Josiah (reigned c. 641 to 609 B.C.E.). "R" is considered to have completed the work, adding transitional elements to weave the stories together as well as some explanatory comments, sometime after the Jewish exiles returned to Jerusalem from the Babylonian Exile in the fifth century B.C.E. The traditional view holds that God revealed the Pentateuch (also called the Torah) to Moses at Mount Sinai in a verbal fashion, and that Moses transcribed this dictation verbatim. Moreover, the Ten Commandments were originally written directly by God onto two tablets of stone. Based on the Talmud (tractate Git. 60a), however, some believe that God may have revealed the Torah piece-by-piece over the 40 years that the Israelites reportedly wandered in the desert. This tradition of Moses being the author of the Torah, long held by both Jewish and Christian authorities, was nearly unanimously affirmed with a few notable exceptions until the seventeeth century B.C.E. Certain traditional rabbinical authorities do evidence skepticism of the Torah's complete Mosaic authorship. The Talmud itself indicates that God dictated only the first four books of the Torah, and that Moses wrote Deuteronomy in his own words (Talmud Bavli, Meg. 31b). The Talmud also affirms that a peculiar section in the Book of Numbers (10:35-36) was originally a title of a separate book, which no longer exists (Sabb. 115b). Recognizing that over the millennia, scribal errors had crept into the text, the Masoretes (seventh to tenth centuries C.E.) compared all extant versions and attempted to create a definitive text. In the twelfth century, Rabbi Abraham ibn Ezra observed that some parts of the Torah presented apparently anachronistic information, which should only have been known after the time of Moses. Later, Rabbi Joseph Bonfils explicitly stated that Joshua (or some later prophet) must have added some phrases. Also in the twelfth century, Rabbi Joseph ben Isaac noted close similarities between a number of supposedly distinct episodes in Exodus and the Book of Numbers. He hypothesized that these incidents represented parallel traditions gathered by Moses, rather than separate incidents. In the thirteenth century, Rabbi Hezekiah ben Manoah noticed the same textual anomalies that Ibn Ezra did and commented that this section of the Torah "is written from the perspective of the future." A number of Enlightenment writers expressed more serious doubts about the traditional view of Mosaic authorship. For example, in the sixteenth century, Andreas Karlstadt noticed that the style of the account of the death of Moses matched the style of the preceding portions of Deuteronomy. He suggested that whoever wrote about the death of Moses also wrote Deuteronomy and perhaps other portions of the Torah. By the seventeenth century, some commentators argued outright that Moses did not write most of the Pentateuch. For instance, in 1651 Thomas Hobbes, in chapter 33 of Leviathan, argued that the Pentateuch dated from after Mosaic times on account of Deuteronomy 34:6 ("no man knoweth of his sepulchre to this day"), Genesis 12:6 ("and the Canaanite was then in the land"), and Num 21:14 (referring to a previous book of Moses's deeds). 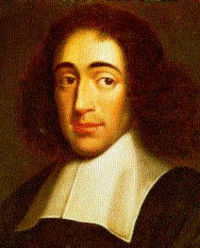 Other skeptics included Isaac de la Peyrère, Baruch Spinoza, Richard Simon, and John Hampden. However, these men found their works condemned and even banned. The French scholar and physician Jean Astruc first introduced the terms Elohist and Jehovist in 1753. Astruc noted that the first chapter of Genesis uses only the word "Elohim" for God, while other sections use the word "Jehovah." He speculated that Moses compiled the Genesis account from earlier documents, some perhaps dating back to Abraham. He also explored the possibility of detecting and separating these documents and assigning them to their original sources. Johann Gottfried Eichhorn further differentiated the two chief documents in 1787. However, neither he nor Astruc denied Mosaic authorship, and they did not analyze the Pentateuch beyond the Book of Exodus. H. Ewald first recognized that the documents that later came to be known as "P" and "J" left traces in other books. F. Tuch showed that "P" and "J" also appeared recognizably in Joshua. 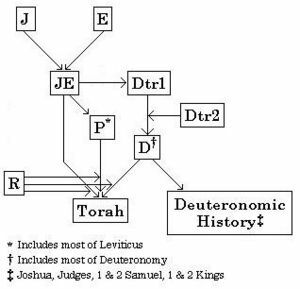 W. M. L. de Wette joined this hypothesis with the earlier idea that the author(s) of the first four books of the Pentateuch did not write the Book of Deuteronomy. In 1805, he attributed Deuteronomy to the time of Josiah (c. 621 B.C.E.). Soon other writers also began considering the idea. By 1823, Eichhorn, too, had abandoned the claim of Mosaic authorship of the Pentateuch. Further developments of the theory were contributed by Friedrich Bleek, Hermann Hupfeld, K. D. Ilgen, August Klostermann, and Karl Heinrich Graf. The mature expression of the documentary hypothesis, however, is usually credited to the work of Graf and Julius Wellhausen. Accordingly it is often referred to as the "Graf-Wellhausen" hypothesis. In 1886, Wellhausen published Prolegomena to the History of Israel, in which he argued that the Bible provides historians with an important source, but that they cannot take it literally. He affirmed that a number of people wrote the "hexateuch" (including the Pentateuch plus the book of Joshua) over a long period. Specifically, he narrowed the field to four distinct narratives, which he identified by the aforementioned Jahwist, Elohist, Deuteronomist and Priestly accounts. He also proposed a Redactor, who edited the four accounts into one text. The "J" source: Here, God's name appears in Hebrew as YHWH, which scholars transliterated in modern times as “Yahweh” (the German spelling uses a "J," prounounced as an English "Y"). Some Bible translations use the term Jehovah for this word, but normally it is translated as "The Lord." The "E" source: Here, God's name is “Elohim” until the revelation of His true name to Moses in the Book of Exodus, after which God's name becomes YHWH in both sources. The "D" or "Dtr." source: The source of the Book of Deuteronomy and parts of the books of Joshua, Judges, Samuel, and Kings. It portrays a strong concern for centralized worship in Jerusalem and an absolute opposition to intermarriage with Canaanites or otherwise mixing Israelite culture with Canaanite traditions. The "P" source: This is the priestly material. It uses Elohim and El Shaddai as names of God and demonstrates a special concern for ritual, liturgy, and religious law. Wellhausen argued that from the style and theological viewpoint of each source, one could draw important historical inferences about the authors and audiences of each particular source. He perceived an evident progression from a relatively informal and decentralized relationship between the people and God in the "J" account, to the more formal and centralized practices of the "D" and "P" accounts. Thus, the sources reveal the process and evolution of the institutionalized Israelite religion. 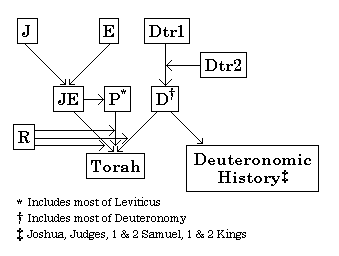 Chart describing one modern update of the original theory, showing influence of "JE" on "D"
Other scholars quickly responded to the documentary understanding of the origin of the five books of Moses, and within a few years it became the predominant hypothesis. While subsequent scholarship has dismissed many of Wellhausen's more specific claims, most historians still accept the general idea that the Pentateuch had a composite origin. An example of a widely accepted update of Wellhausen's version came in the 1950s when Israeli historian Yehezkel Kaufmann published The Religion of Israel, from Its Beginnings to the Babylonian Exile (1960), in which he argued for the order of the sources as "J," "E," "P," and "D"—whereas Wellhausan had placed "P" after "D." The exact dates and contexts of each source, as well as their relationships to each other, have also been much debated. Richard Elliott Friedman's Who Wrote The Bible? (1981) offers a very reader-friendly and yet comprehensive argument explaining Friedman's opinions as to the possible identity of each of those authors and, more important, why they wrote what they wrote. Harold Bloom's The Book of J (1990) includes the publication of the J source only as a stand-alone document, creatively translated by co-author, David Rosenberg. Bloom argues that "J," whom he believes to be a literary genius on a par with William Shakespeare, was a woman living at the time of King Rehoboam of Judah. More recently, Israel Finkelstein (2001) and William Dever (2001) have each written a book correlating the documentary hypothesis with current archaeological research. Most Orthodox Jews and many conservative Christians reject the documentary hypothesis entirely and accept the traditional view that Moses essentially produced the whole Torah. Jewish sources predating the emergence of the documentary hypothesis offer alternative explanations for the stylistic differences and alternative divine names from which the hypothesis originated. For instance, some regard the name Yahweh (YHWH) as an expression of God's mercifulness, while Elohim expresses His commitment to law and judgment. Traditional Jewish literature cites this concept frequently. Over the last century, an entire literature has developed within conservative scholarship and religious communities dedicated to the refutation of biblical criticism in general and of the documentary hypothesis in particular. R. N. Whybray's The Making of the Pentateuch offers a critique of the hypothesis from a critical perspective. Biblical archaeologist W. F. Albright stated that even the most ardent proponents of the documentary hypothesis must admit that no tangible, external evidence for the existence of the hypothesized "J," "E," "D," "P" sources exists. The late Dr. Yohanan Aharoni, in his work Canaanite Israel During the Period of Israeli Occupation, states, "[r]ecent archaeological discoveries have decisively changed the entire approach of Bible critics" and that later authors or editors could not have put together or invented these stories hundreds of years after they happened. Some studies claim to show a literary consistency throughout the Pentateuch. For instance, a 1980 computer-based study at Hebrew University in Israel concluded that a single author most likely wrote the Pentateuch. However, others have rejected this study for a number of reasons, including the fact that a single later editor can rewrite a text in a uniform voice. ↑ “Pentateuch,” Catholic Encyclopedia. Retrieved August 30, 2007. ↑ Shalom Carmy (ed. ), Modern Scholarship in the Study of Torah: Contributions and Limitations (Lanham, MD: Jason Aronson, 1996, ISBN 978-1568214504). ↑ Prolegomena by Julius Wellhausen at Project Gutenberg. Retrieved August 30, 2007. ↑ Biblical Criticism - The Jewish View, SimpleToRemember.com - Judaism Online. Retrieved August 30, 2007.